The second post in the series of Complex Field Types. Here, I will explain to you the “Link Types”. Droplink: This field type is similar to the Droplist (Droplist is available as a List type see here). For the end user, it works as Droplist list only, but in backend, it refers to an item instead of rendering string like Droplist does. It references to items based on the source provided to the field in the template. The selection type is the Single item at a time. Droplink does not support the field render. The source of Droplink can be XPath query, GUID and Item Path. Droptree: Droptree shows items as a tree-view instead of showing them as the dropdown. The user is allowed to select a single item at a time. 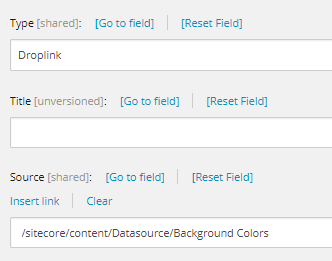 It shows complete Sitecore tree if the source is not provided at the time of field declaration. The source can be XPath Query or GUID and Item Path. Droptree does not support field render. General Link with Search: Similar to General Link type, this type comes with an extra feature “Search for a link”. This feature allows editors to search for an item which is referenced in the field. This field type supports field render. Version Identity: and Version Link: field types are used by Sitecore for internal purposes. For List Types, you can refer to my previous post.